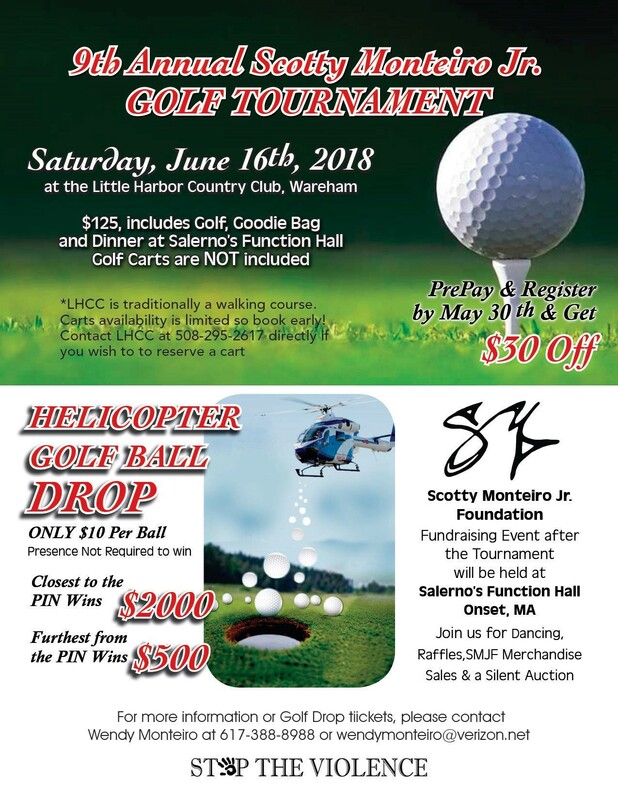 Support a Great Cause at the Scotty Monteiro Jr. Foundation 9th Annual Golf Tournament! $125.00 per person includes golf, and dinner. Great Prizes to Be Awarded. Join us for a night of fun, dancing, raffles, galore! Applications can be downloaded here or picked up at The Bay Pointe Club. You can also donate to our cause online here. Contact Wendy at 508-291-1925 or wendymonteiro@verizion.net and ask about our VIP Bracelets. Prepay before May 1st and save $25. Become a Hole Sponsor for $100 or a Platinum Sponsor for $500. Your sign will be seen by hundreds of people. Support a Great Cause! Download the Sponsorship Application Here. $10 can win you $2,000! Ball closest to the pin wins the $2,000 and the ball furthest from the pin wins $500. This year the Scotty Monteiro Jr, Foundation brought Rachel’s Challenge – Anti Bullying, Chain Reaction to the Wareham Public Schools. This program is designed to teach students about the ramifications of bullying and the tremendous consequences of those actions. Each day 160,000 students do not go to school because they are bullied, teased and harassed. By turning the story of a tragic death at Columbine High School into a mission for change, Rachel’s Challenge is helping create safer learning environments and making a world-wide impact. 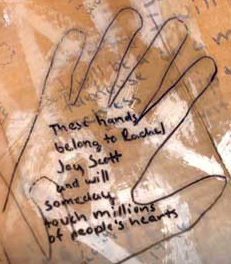 Rachel’s Challenge was started by Rachel’s dad and stepmom, Darrell and Sandy Scott when they realized that the writings and drawings Rachel left not only had an impact on her friends and classmates, but also resonated with students around the world. Although Rachel was a typical teenager who even wrote about her “ups and downs,” she had a passion and conviction that she would someday change the world. The Scott family knew her story and passion had to be told to inspire others to make their world a better place. More than 18 million people have been touched by Rachel’s message, and they continue the legacy of making a difference in their communities. Each year at least 2 million more people are added to that number. These are just a couple of the results of Rachel’s Challenge. In one survey, 78% of students indicated they would definitely intervene in a bullying incident in their school after seeing Rachel’s Challenge. In the last 3 years, Rachel’s Challenge has received nearly 500 unsolicited emails from students stating that after hearing Rachel’s story they reached out for help as they were contemplating suicide. Some even state that “Rachel saved their life”. Rachel’s Challenge is a non-profit, non-political, non-religious organization based in Littleton, Colorado. Chris Herren is a MA local who attended Durfee High School. He later played professional basketball for the Boston Celtics. Unfortunately, his career was cut short by drugs. He has been drug free since 2008 and is now a sought-after motivational speaker. Because drugs and violence go hand-in-hand, The Scotty Monteiro Jr. Foundation decided to sponsor this speaking engagement. This is all possible due to contributions from you – the supporters of the Scotty Monteiro Jr. Foundation fundraising events. We would like to remind you that in addition to attending the events, you can also donate any time simply by clicking on the “Donate” button at the bottom of our main page. As always, thank you for your continuing support! Salerno’s Function Hall, Onset Ave.